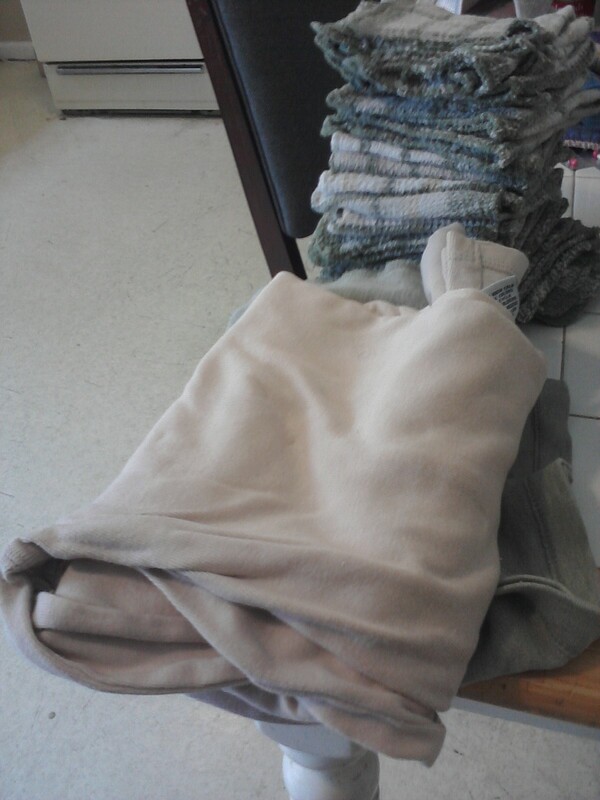 I kept our rags and kitchen towels in a laundry basket on top of the dryer for a long time. 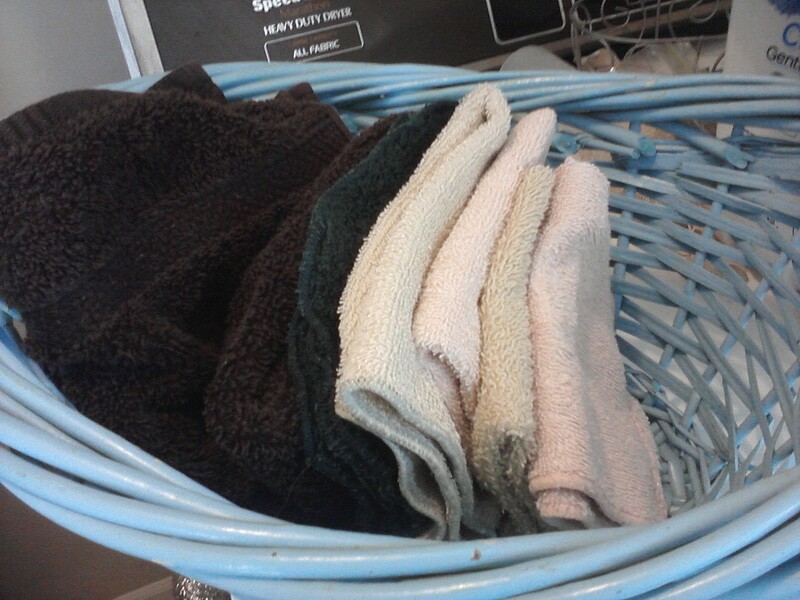 I use different towels for drying clean dishes (L) than for drying potentially dirty hands (R) in the kitchen. I just keep them separate so I know what to put out. 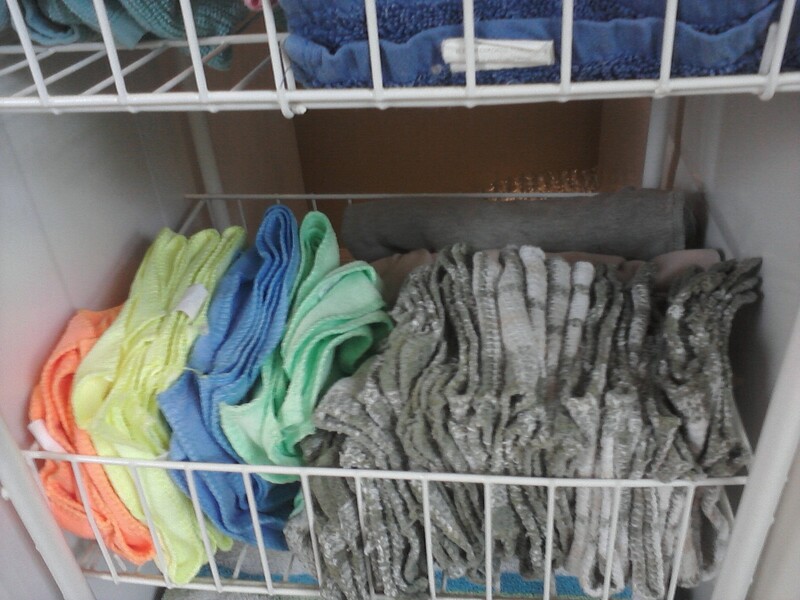 Kind of an OCD thing… O-well! 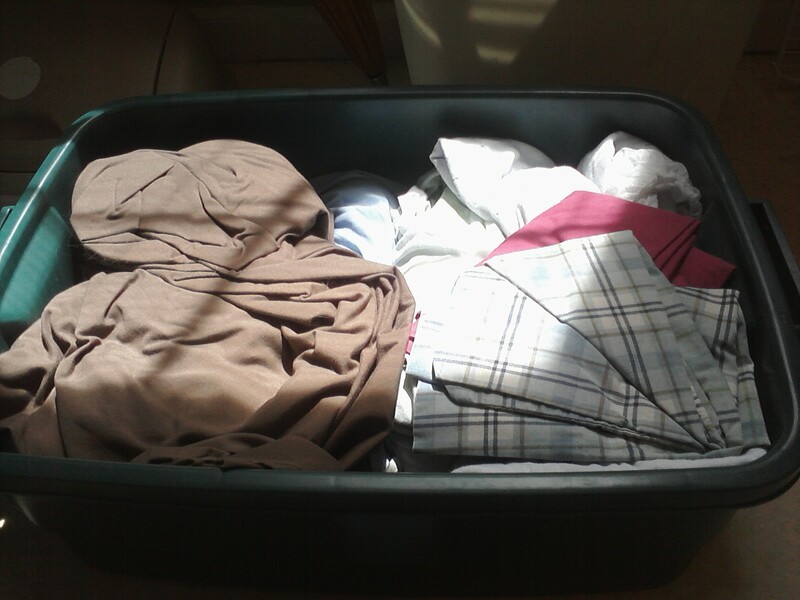 Now, I also had a big rubbermaid tub filled with sheets. I wash sheets once a week and put them back on before bedtime. It’s rare that I actually use a different set of sheets. And we only have two sets. I found a few sheets in here from my old twin bed which I no longer even have! 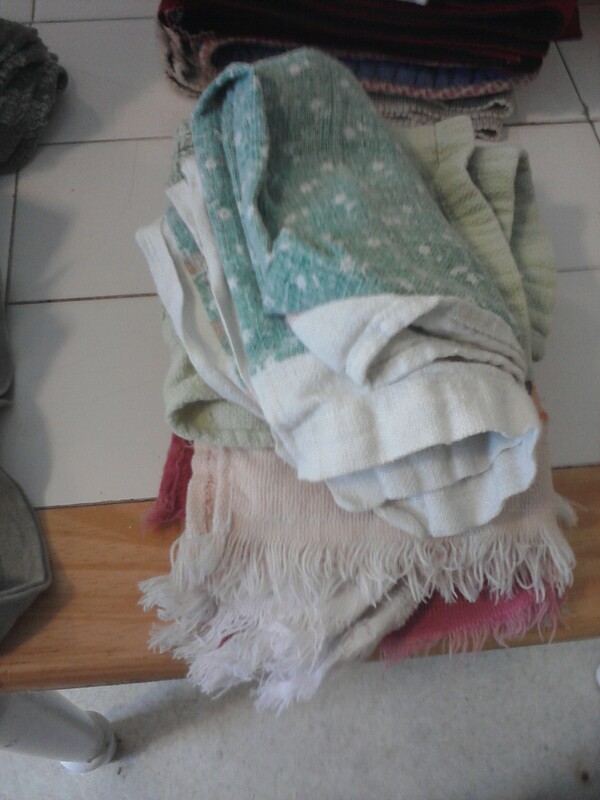 I kept all the showering towels and rag towels in the bathroom, practically on display, for lack of somewhere else to put them. 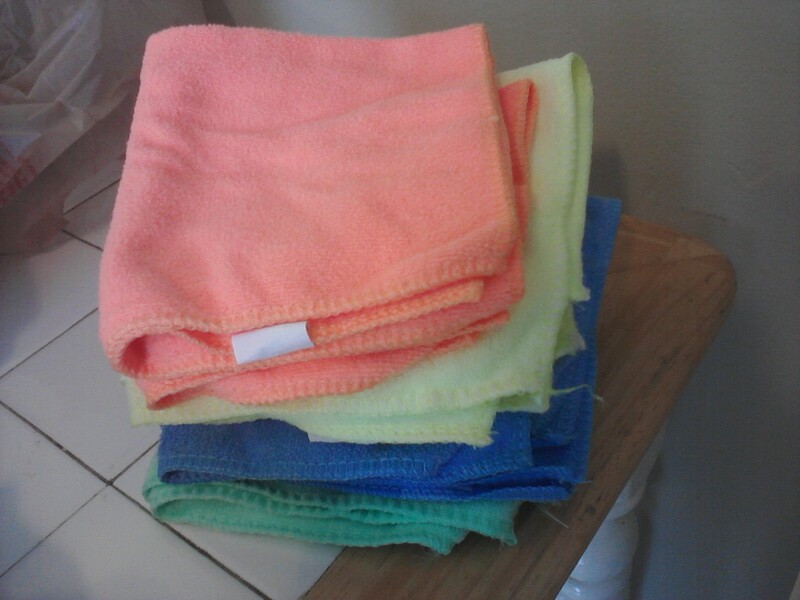 I wash the towels so fast that we really only use a body towel for each of us and switch out between two hand towels. 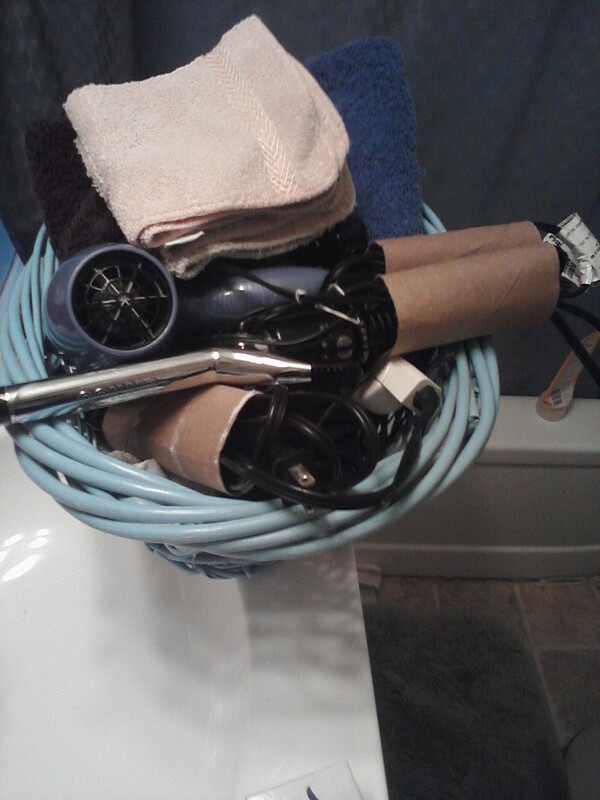 Yet… all the towels. 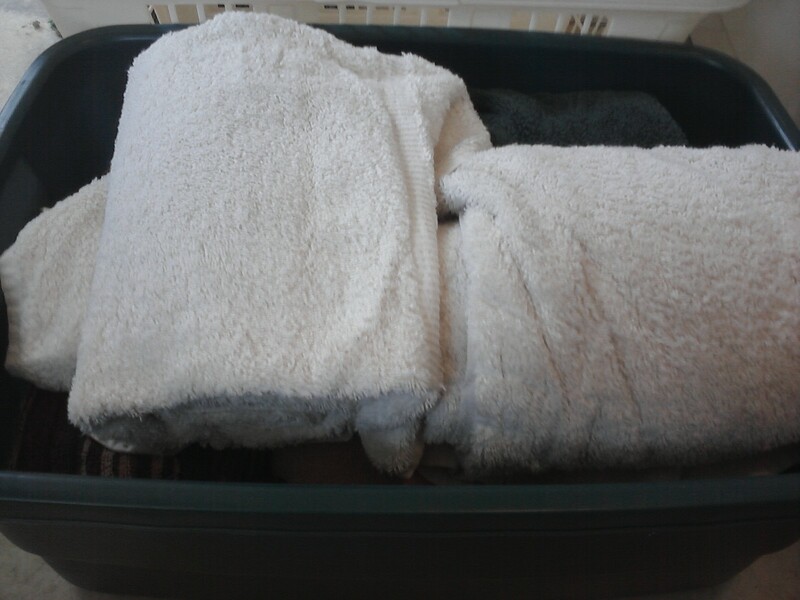 Also had some washcloths and extra hand towels in a basket with my hair dryer, etc. ? 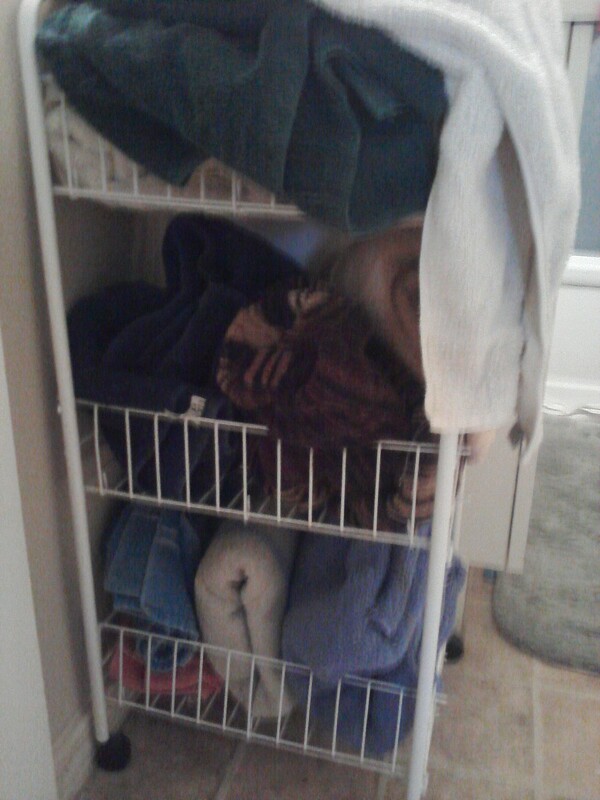 I moved the thing with the towels on it to the laundry room, between the washer and dryer. 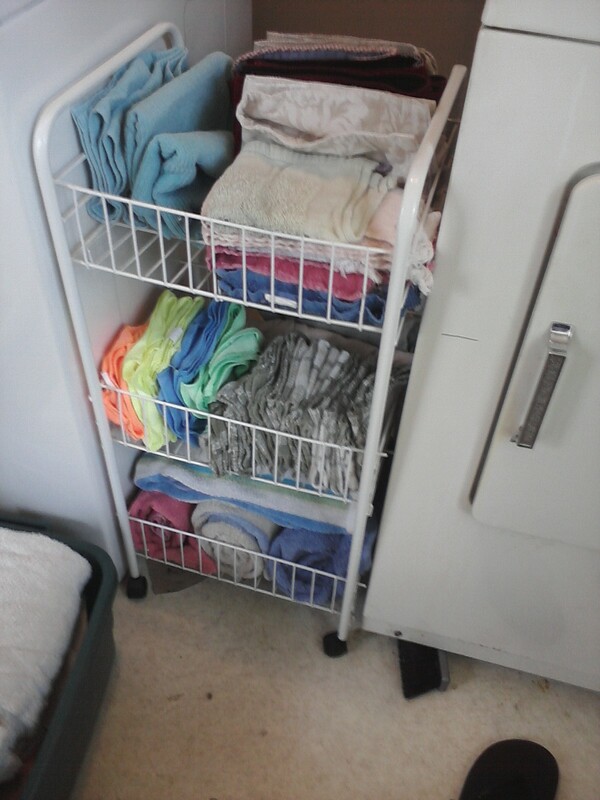 Top rack is kitchen towels (for hands and drying dishes!) 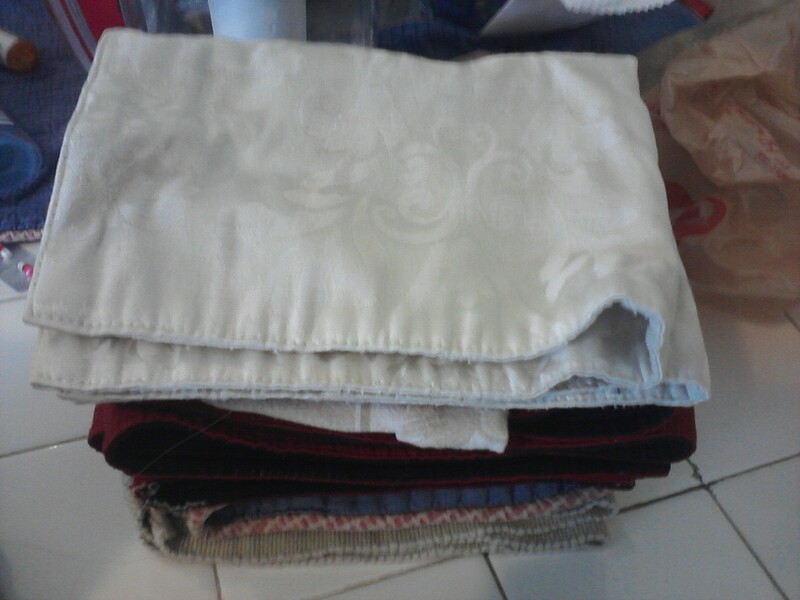 and placemats, which we use often. 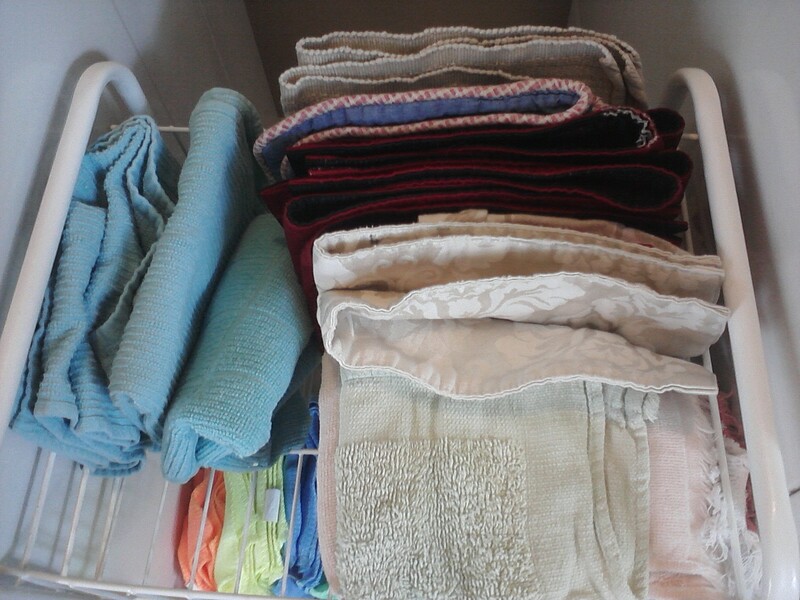 Middle shelf includes the rags and microfiber cloths, which I also use pretty frequently – especially the rags. 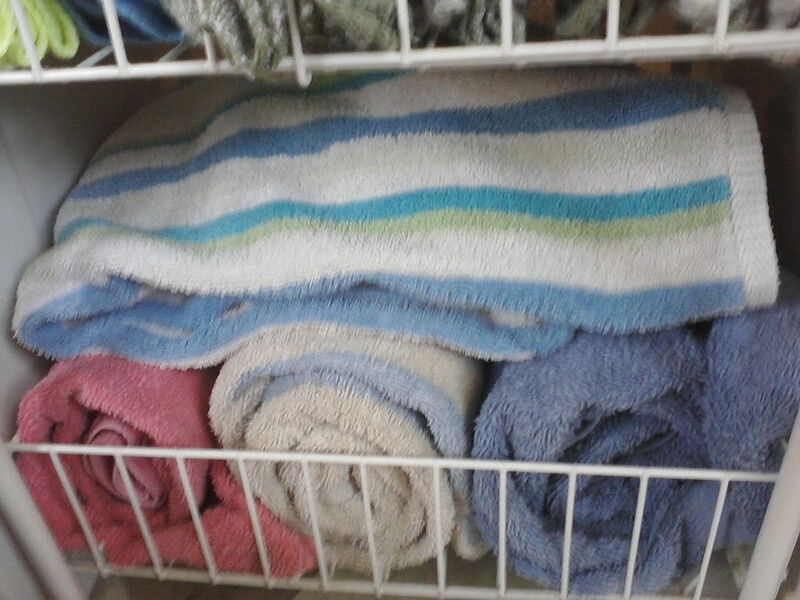 Bottom shelf is 4 rag towels. We use these for emergencies, like when our washing machine was leaking water. 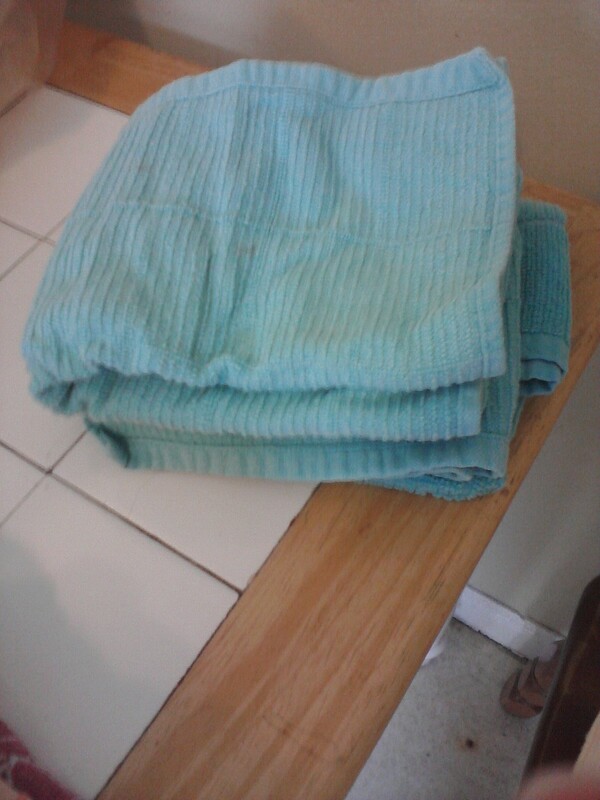 And all those extra towels that we rarely use? In the Rubbermaid container for guests or us, should we need them. 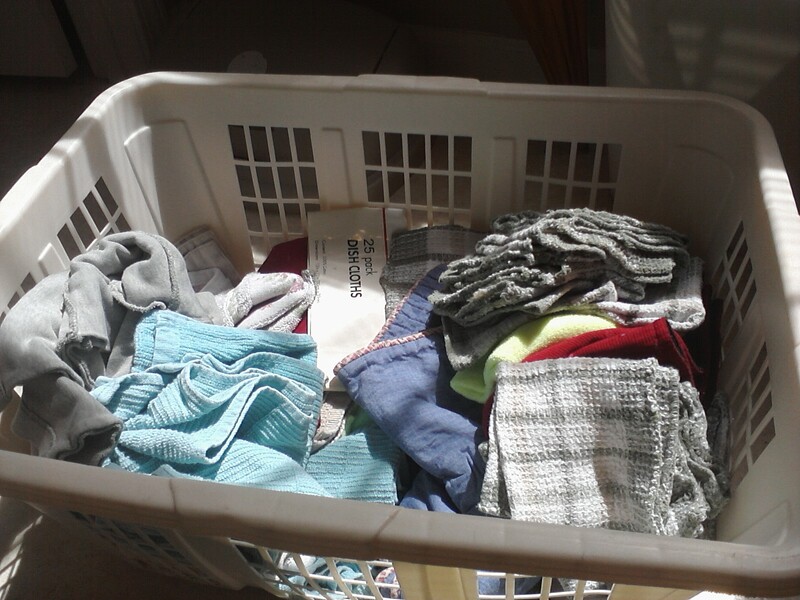 This entry was posted in Organization and tagged clean, cleaning, declutter, organization, organize. Bookmark the permalink.